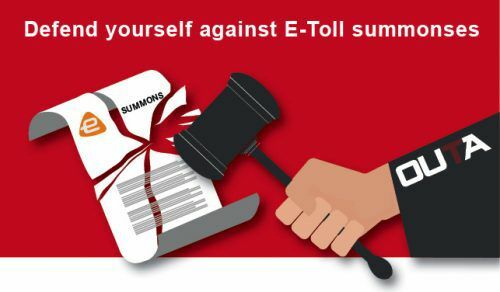 I’VE RECEIVED AN E-TOLL SUMMONS, NOW WHAT? If you or your businesses are served a summons for the non-payment of e-tolls, the input below provides guidance and steps to be taken. If you have received a summons, you need to act quickly. Please click here and complete the form with your information and the details of this notification. An OUTA representative will then be in contact with you in order to ensure that the matter is timeously and efficiently defended. It is important that you follow certain procedures in order to have the best chance of defending yourself. If you require assistance from OUTA to ensure the correct procedures are followed, please notify us immediately before the period for the delivery of the notice of intention to defend expires (10 business days after receipt of summons from the Sheriff). Please feel free to call us on 087 170 0639 during office hours. There is a likelihood that SANRAL will first send letters of demand to the public en mass, prior to issuing summons. Letters of demand are not a prerequisite for the issuing of a summons, but they are standard practice. With respect to the receipt of a letter of demand, you have the option of either responding to it, or of not responding. The pros of responding is that it will potentially reflect your good faith before the court, should the matter become litigious. Furthermore, you could raise the bar in respect of the onus of proof, by requiring SANRAL to provide you with detailed undisputable information in relation to the accuracy of all of the information that is stated in the said letter, this in particular being your alleged financial liability. Alternatively, you could simply state that you deny any and all liability in respect of the amount that SANRAL deems that you owe, and that you fully and expressly reserve all of your rights in respect of the matter. You could also simply ignore the letter of demand, and wait for SANRAL to issue a summons. (ii) To defend the matter. Conceding Liability – If you decide to concede liability, you must contact the attorneys on record for SANRAL, and inform them that you want to concede liability, and you will then be required to make a payment arrangement. Depending on the instructions and mandate that the attorneys have received from SANRAL, it is possible that you could negotiate a further discount on the amount that the summons is suing you for. Defending the Matter – we suggest that you contact an attorney as a matter of urgency, as you would need to file a notice of intention to defend, within the period stipulated in the summons. The notice of intention to defend must be served on the attorneys of SANRAL, and any other attorneys who are listed in the summons. Service simply means that you take a copy to provide to them, and they must acknowledge receipt thereof. Acknowledgement of receipt means that an authorised representative must either stamp or sign the original, and specify the date and time when the notice of intention to defend was served. Your original notice of intention to defend, which must reflect that all the attorneys on record have been served with the document, must then be filed at the court that has jurisdiction and will be hearing the matter, the details of which will be clearly reflected on the first page of the summons. Within fifteen days of your notice of intention to defend, SANRAL will need to provide you with their declaration of the charge and details thereof. You will then have TWENTY BUSINESS DAYS within which you must submit your plea, which provide your detailed reasons of why you believe you are not liable to pay the money you allegedly owe. This document is called your plea. We strongly suggest that you obtain an attorney to draft, finalise, and file this document on your behalf. For help in preparing the plea, you could possibly refer to OUTA’s “rule of law” campaign. What happens after you have filed the Plea? The processes of pleading will continue, until there is what is formally known as a close of pleadings. Your attorney will advise and guide you in respect of these processes. The matter will then be set down for trial. SANRAL has clearly stated that these matters will be taken to the High Court, so each case will have to be placed on the court roll. The current opposed High Court roll is such that it could take an average of two years before your case is placed on the roll, this meaning that it would only be heard by a judge in roughly two years time. Prior to the matter being heard, the parties will usually attempt to settle the matter out of court during processes such as the request for further particulars, the discovery of documents, the pre-trial conference, etc., but your attorney will formally brief you in respect of all of these processes.